WEST Coast’s Chris Masten and Sydney Swan Kieren Jack are unlikely to play in this year’s finals series, leading medico Dr Peter Larkins says. Masten was substituted out of the game against St Kilda in Perth on Saturday night after injuring his right hamstring in the second term. “I don’t imagine he’s going to play the rest of the finals series with that right hamstring injury,” Larkins said of Masten. “You usually wouldn’t risk a player three weeks in after a reasonably significant injury like that. Jack injured the medial ligament in his left knee when Gold Coast midfielder Danny Stanley fell across his knee at the SCG on Saturday night. The Swans expect the star onballer to miss up to three weeks, although Larkins said the prognosis was probably slightly worse. “The odds are against him, in terms of the normal time for a medium medial ligament tear,” Larkins said. “It’s a big call to put a player into a Grand Final coming back from injury and looking at the timeframe that’s about the earliest you would expect him to have recovered from that style of injury. The news is better for Hawthorn running machine Isaac Smith whose own medial ligament injury is on the lower-end of the scale, although Larkins believes the wingman will miss Friday night’s qualifying final showdown with the Eagles. “We can draw a distinction with Kieren Jack – it’s of a much lower severity,” Larkins said. “It’s still a risk to play him this week coming – especially because they have to travel to Perth and the travel time also needs to be factored in. However, Larkins expects Fremantle star Nat Fyfe to be fit for his side’s qualifying final against the Sydney Swans at Domain Stadium on Saturday. Fyfe has not played since round 21 because of a stress reaction in the fibula bone in his left leg, with a large-scale knock on the injured spot a chance to worsen into a cracked fibula according to Larkins. “He’s in the 50-50 category again,” Larkins said. “He’s been very limited in the load-bearing training he can do – he did some light running, though, which was great. “It’s not going to be 100 per cent right after just having two weeks away from normal training but it will be a lot less sore and he should be able to move a lot better this week. – He does not expect North Melbourne youngster Kayne Turner to complete his full concussion recovery protocol in time for Sunday’s clash with Richmond at the MCG. 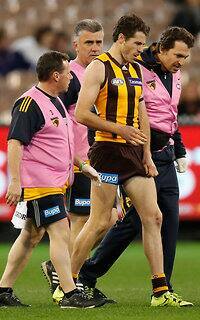 Turner was taken off on a stretcher after being knocked out in round 23. – However, teammate Jack Ziebell’s head knock was lower in its severity and Larkins believes he will play against the Tigers. – Western Bulldogs forward Stewart Crameri (left knee bone bruising) would be a certain starter for Saturday night’s elimination final against Adelaide. – Eagles defender Jeremy McGovern would be monitored closely throughout the finals series because he is clearly restricted in his movement of his injured left shoulder. – Only an eternal optimist would view Swans midfielder Luke Parker (broken fibula) as any sort of chance to take part in this year’s finals series. – Swans pair Lance Franklin (back/rib cartilage) and Gary Rohan (knee) are not 100 per cent fit but are likely to play against the Dockers on Saturday.